ARE YOU “GOING GREEN?” This is a great story that we included here because it is so true! She was right — our generation didn’t have the ‘green thing’ in our day. Back then, we returned milk bottles, soda bottles, and beer bottles to the store. The store sent them back to the plant to be washed, sterilized, and refilled, so it could use the same bottles over and over. So they really were recycled. But we didn’t have the “green thing” back in our day. Grocery stores bagged our groceries in brown paper bags, that we reused for numerous things, most memorable, besides household garbage bags, was the use of brown paper bags as book covers for our schoolbooks. This was to ensure that public property (the books provided for our use by the school) was not defaced by our scribbling. Then we were able to personalize our books on the brown bag but we didn’t do the “green thing” back then. We walked up stairs because we didn’t have an escalator in every store and office building. We walked to the grocery store and didn’t climb into a 300-horsepower machine every time we had to go two blocks. But she was right. We didn’t have the “green thing” in our day. Back then, we washed the baby’s diapers because we didn’t have the throwaway kind. We dried clothes on a line — not in an energy-gobbling machine burning up 220 volts — wind and solar power really did dry our clothes back in our early days. Kids got hand-me-down clothes from their brothers or sisters, not always brand-new clothing. Back then we had one TV, or radio, in the house — not a TV in every room. And the TV had a small screen the size of a handkerchief (remember them? ), not a screen the size of the state of Montana . In the kitchen, we blended and stirred by hand because we didn’t have electric machines to do everything for us. When we packaged a fragile item to send in the mail, we used wadded up old newspapers to cushion it, not Styrofoam or plastic bubble wrap. Back then we didn’t fire up an engine and burn gasoline just to cut the lawn. We used a push mower that ran on human power. We exercised by working so we didn’t need to go to a health club to run on treadmills that operate on electricity. But she’s right; we didn’t have the “green thing” back then. We drank from a fountain when we were thirsty instead of using a cup or a plastic bottle every time we had a drink of water. Writing pens were refilled with ink instead of buying a new pen, and we replaced the razor blades in a razor instead of throwing away the whole razor just because the blade got dull. But we didn’t have the “green thing” back then. Back then people took the streetcar or a bus and kids rode their bikes to school or walked instead of turning their moms into a 24-hour taxi service in the family’s $45,000 SUV or van, which cost what a whole house did before the “green thing.” We had one electrical outlet in a room, not an entire bank of sockets to power a dozen appliances. And we didn’t need a computerized gadget to receive a signal beamed from satellites 23,000 miles out in space in order to find the nearest burger joint. But isn’t it sad the current generation laments how wasteful we old folks were just because we didn’t have the “green thing” back then? We don’t like being old in the first place, so it doesn’t take much to piss us off . . . especially from a tattooed, multiple pierced smartass who can’t make change without the cash register telling them how much. Your car, your furnace, the air conditioner, even the lights all contribute to the amount of energy that you use in terms of electricity as well as a fuel that you burn in your furnace. By turning your temperature gauge up or down you can save significant amounts of energy and reduce the overall cost of heating and cooling. Our natural gas supplier has recently announced a 40% increase in the cost of gas. This is what we use to heat our house in the wintertime! A 40% increase is huge and will add a great deal of cost to our annual budget. In addition our electricity provider has also increase the cost of electricity provided to us by 4% which is a lot smaller compared to what our natural gas supplier did. Still this is more money out of our wallets and on an annual basis we’ll probably add at least $100 to the cost of electricity that we use. This is why it is important to reduce the energy that we use to leave more money in our wallets! By simply turning down the thermostat by one or 2° in wintertime will save you at least 10% on your overall energy costs. You will use less fuel and less electricity on your furnace and electricity that you use to run the furnace. Turning off the lights will also save energy. Managing how often you drive your car and bunching together errands will reduce the amount of gasoline that you use. Gasoline recently increased by 20% so makes a lot of sense to be a smart driver. Reduce the amount of gasoline that you actually burn every day. These are direct savings that you can make simply by being smart about how you use electricity. Also fuel to heat your house and gasoline to drive your car. Believe it or not you can also be more efficient energy use indirectly as well. Purchasing larger quantities of food reduces the amount of overall packaging that you have to throw away. The energy that it took to produce packaging is reduced. This will save money in the long run for you in terms of your food costs. Also reduce the amount of shipping and manufacturing cost as well. Another great example is our water bill. Our water costs are included in the taxes that we pay on our property. Since we don’t have a meter we tend to use a lot more water than we would if it was metered and we had to pay by the cubic meter. By reducing the amount of water that you use you can indirectly affect your tax bill and keep it as low as possible over the coming years. There has been a big push in the last dozen years for consumers to use less energy in their every day lives. From cars to appliances. Even the grocery bags that we use when we purchase our groceries has come under the gun. We now have fluorescent lights. LED lights which use far less energy and all of our appliances are also designed to use less energy. There is hardly a person among us that does not take into account how much energy we use. How can we reduce the energy we use when we purchase something? The energy pyramid is one persons view of where to begin with regards to reducing your energy foot print. The latest report out of the IPCC for 2013 suggests that we need to do more. Much more to lessen the impacts of global warming. In fact we have made some progress. We apparently are not heating up the earth at the same rate that we were. But it is still going up and projected to continue unless we do something drastic. What do they mean by drastic? 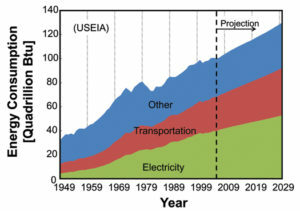 Even though our cars and trucks are probably twice as efficient as they were back in the 70’s and 80’s. There are more and more cars on the roads and we are burning more fossil fuels than ever before which contributes to global warming. We have to wean ourselves from fossil fuels if we are going to really make a difference. In our estimation, we need to make major strides towards electric vehicles, towards wind energy generation, and solar power to really make a difference. We have started with a number of cars on the road that are electrical only, but we really need to make it much further where the car that is adopted the most is in fact an electric vehicle. Power generation even if it is generated by coal or oil burning plants is still more efficient than all of the cars that are on the roads burning gasoline, however where we can make real strides is a giant shift to renewable energy such as solar and wind technology. There are many, but in this writers mind there are two major ones. First the cost for consumers to switch over are still too high. No one wants to buy a car that is $5000 to $10000 more expensive than it’s gasoline counterpart no matter how cheap it is to operate. And this is assuming they solve the distance issue and the rapid charge issue. The second issue that industry is struggling with is the massive infrastructure that is set up to process oil, make gasoline and distribute it to the consumer. There are millions of jobs at stake and there are literally billions of dollars at stake as well. The social engineers among us must solve these two major problems before we will see a major shift from fossil fuel technology to renewable energy technology that will make a real difference in the amount of fossil fuel energy that we consume. This is an intensely interest issue and it will take many twists and turns before being resolved. In the mean time we will continue to endure increasing temperatures around the world and global warming! Thoughts and comments are welcome. The question about what home appliances use the most electricity is actually a little more complex than the obvious answers. At first glance we might think that appliances such as ovens, refrigerators, freezers, clothes dryers, pool pumps, furnaces and air conditioners would use the most energy around the home. The real answer is that it depends on the actual appliance and your life style regarding how you heat your home, cool your home, conversion to energy saving devices and so on. For example, our neighbor sets his air conditioning at 21 C or 70F all day and all evening long. His wife likes to sleep with the window open in the summer and the winter time with the corresponding energy loss that is associated with open windows. Another neighbor sets his AC at 24C or 75 F at night and even higher during the day. Clothes dryers take a lot of energy and can cost a lot unless you only use then during non peak times such as in the evening and weekends. In a situation where you only dry your clothes in the evenings or on weekends, your clothes dryer may actually use even less energy than your AC system. What about the oven? It uses a lot of energy when in use, but if you cook during non peak times or use the microwave which is very efficient, you can reduce your oven energy use significantly. From a ranking perspective, ovens, dryers, air conditioning units and incandescent lights use a lot of energy. If you know which appliances use the most and then try to limit their use, then you can actually save and reduce total energy use. For example use the microwave whenever you can instead of the oven. Set your fridge temperature a degree or two higher. The same applies to the AC system. If you heat your home in the winter time, setting your inside temperature at 21C or 70 F will reduce your overall usage compared to someone who keeps their home at an even 24 C or 75F all day long. There are all kinds of steps that consumers can take which will reduce their energy usage and save them a great deal of money. Use your appliances wisely even the ones that use a lot of energy, but limit their usage to reduce your overall energy foot print. Turn up the temperature in the summer to reduce AC, turn down the temperature in the winter to reduce heating energy, use the microwave instead of the oven, turn up the temperature of the fridge and the freezer, use the clothes dryer and all appliances in non peak hours, turn your pool pump on at night and only run it for a few hours a day and so on. We have a number of posts on this site that provide more detail and more information on how to save energy overall. It is not always the appliance that uses the most electricity that you have to focus on! Many customers would rather spend sixty cents on an incandescent light bulb vs. a fluorescent light bulb which may cost several dollars. LED’s are even more expensive and the initial cost is a huge deterrent to going green. Never mind the fact that from a pure economic perspective the LED bulb because of it’s long life and low electrical usage is far superior than the incandescent bulb. Somehow we have to get over the initial cost shock for things that are green energy. Hybrid cars and all electric cars have the same problem. The sticker price shock is too much for many car buyers when you can purchase the same non hybrid car for much less. This increase in price for these cars makes the economic argument to go green much more difficult to deal with when you have to pay several thousand dollars more for the same car. Would You Invest in a Green Energy Company? It turns out that a company who is investing in green energy technology is much more difficult to get off the ground. A software company that starts up in a garage just needs a couple of computers and some smart guys who have a great idea and understand how to program the software. Green energy technology companies on the other hand are working on technology that costs a lot of money just to get started and develop. In some cases you need millions of dollars to demonstrate how you can save or reduce energy consumption. Venture capital firms are very careful not to sink a great deal of money into these companies, because you can quickly lose a great deal on a technology that does not produce the savings that they are looking for. There definitely is a long term trend to create devices that use less electricity, that generate electricity for consumers and reduce the overall consumption. The same applies to the use of fuel whether it is gasoline, propane or natural gas. Every time a consumer purchases something that consumes energy, we believe that they should do the quick math to evaluate how long it will take to pay for the item based on savings that they should derive from using this device. If it pays for itself in less time than the expected life of the item then you are ahead of the game. Light bulbs clearly fall into this category as well as high efficiency furnaces and water heaters. Make an informed decision every time you purchase something. Ensure that you are saving yourself money over the long term when you take into account the purchase cost and the operating cost of several alternatives. That’s our view of investing in green energy in 2013. You may have seen similar diagrams and pictures of homes showing the areas where heat loss occurs in your home. This particular one is from an article in Britain and therefore the savings are indicated in pounds rather than dollars. Don’t be concerned about the currency. We all have the same issues when it comes to improving energy savings for our homes. If you are not well insulated, then you are going to lose heat somewhere. That means it is going to cost you money as well. You may have upgraded your furnace and your water heater to the latest models. You are already achieving high efficiency with these devices. When we say high efficiency, anything above 95% efficient is considered high efficiency. Especially compared to older models which were down in the 60% range. Consumers who have taken this step to upgrade their furnace are already saving money. They are using the fuel they are paying for as efficiently as possible. But the next area to be concerned about is what is happening to the heat once it is distributed within your home. Is most of it escaping out through the roof, the walls, the windows or the doors? As you can see from this diagram or picture, a great deal of heat loss can occur if you do not take steps to properly insulate your attic, walls, windows and doors in your home. You may already have insulation in your attic and as far as you know the rest of the house is ok.
Have an energy consultant assess your home and give an estimate of what it would take to make your home more energy efficient. Windows can be upgraded to with double pains and argon in between to deliver maximum efficiency. Also apply caulking around them to ensure that there are no gaps to allow air to escape or enter the home along with insects and possibly moisture. Your windows can allow a third of your heat to escape unless they are properly installed and efficient. By doing a pressure test of your home you can also find out where all of the leaks are. By applying caulking in these areas and also plugging or adding insulation as appropriate, consumers can reduce the drafts as well as reduce their heat loss and improve their heating bills as well. Doors and floors can be responsible for as much as 11% according to these estimates of your total heat loss. Even though lower than the windows, it is still substantial and relatively easy to repair and inexpensive as well. A pressure test may cost you something, the real question is how quickly will you recover this cost through energy savings? The roof or attic is the next major area to tackle. First make sure the attic is adequately vented to remove heat from your attic. By removing the heat naturally, the cost to cool your home would also be reduced. Insulation in your attic should be at least R25 or higher to decrease the amount of energy being lost through the roof area. Following these areas can be the best way to improving energy efficiency. How can home owners improve energy efficiency? And also reduce their energy bills as well? 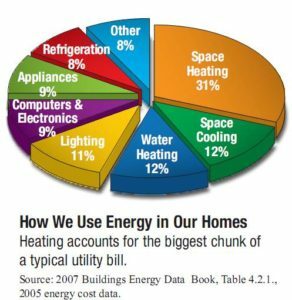 Frankly most consumers probably do not car that much how energy efficient their appliances etc are, they just want a lower monthly bill for their electrical usage and their heating or cooling energy use. The same applies to their car since most people just know what it will cost them to fill up their gas tank in their car and it is getting higher all of the time. In fact everything is going up and it is becoming more important to take advantage of every energy efficient thing you can do to reduce your total cost. In this post we will take a look at a few things that can at least reduce or control how much your energy bills are going to be. The first step is to know what your energy is costing you today and over the past 12 months. If people can see some improvement then they will feel a lot more motivated to control their energy costs and take steps to reduce their overall use of energy. Collect you bills for the past 12 months and add up the total cost of your electrical usage, your heating costs and your cooling costs. Electrical may already include your cooling costs if you use AC to cool your home. Now that you know what you paid in the past 12 months, the next step is to determine if your utility plans to raise the price at all over the next 12 months. Most utilities try to work in a price increase every 12 months, so you need to be aware of this when you are comparing year over year. The next step is to look at what you can do to reduce your overall energy usage. There is nothing scientific about this step. It is just being consistent and getting your family to participate and help you. Turn lights off when you are not in the room. Wash and dry clothes when in off peak hours if your electricity is billed in peak and non peak times. Set your air conditioner to do most of it’s work during non-peak times. Set your air conditioner one or two degrees higher on average to further reduce your power usage. The same applies if you need to heat your home in the winter. Set your temperature lower on average and lower when you are not at home. Make use of computer controlled thermostat to heat or cool your home accordingly. Water usage can be decrease as well if you are careful. You do not want your lawn to die from lack of water, however you can water in the evening to reduce evaporation. You can water specific plants rather than watering everything. Wash dishes in the dishwasher when there is a full load. Apply the same rule to washing clothes in the washing machine. Install efficient toilets and efficient shower heads to further decrease the water use. Compare your bills and in particular the usage rate for kilowatts used, or Ccf of water and so on along with the total cost to see how much energy and money you are saving. Allow for a few months and then look at the total for a quarter. All those jack rabbit stops and starts really use a lot of gas. So does driving around town and tires that are under pressurized. Your tires and brakes also wear faster as well. Keep your car properly turned up and walk or take the bus when you can instead of driving around the block to the corner store. You may not save money from an energy perspective, but consumers can save a great deal of money by negotiating lower rates for these services. Cut back on features or buy your own PVR instead of renting it forever. Sometimes by just talking to the utility and asking if there is a better deal for what you have is all that is needed to save a few dollars a month. Some people will say that they are not concerned about a few dollars. It is not that much so why should I spend my time on a small amount. Well a few dollars on each utility can add up to a $100 a month or $1200 a year. Now that is worthwhile in my books to look at and consider. We all can do a lot with this kind of money! This post is about all of the energy efficient solutions that the average home owner might want to consider in an effort to reduce his or her total energy bill and make a contribution to reducing energy overall. This will save money too. We are covering a lot of different topics, which are listed below. Most people are more motivated about saving money than they are about saving energy. By focusing on Energy Efficient Solutions, they can reduce their utility bills and have extra money to spend in other areas. Scroll down to your area of interest or read the entire post. Our cars and trucks are one of the largest energy consumers on the planet and our pocket book. Prices of gasoline and diesel fuel continue to go up, with gasoline recently reaching over $5 per gallon in California. We decided to include a large section just on cars that consumers can consider as a means of reducing their energy consumption in this area as part of the energy efficient solutions that we all should be striving for. Driving Habits – play a large part in how much gasoline we actually use. Jack rabbit starts from stop signs and stop lights consume a huge amount of gasoline compared to gradual acceleration. Your car is designed for optimum energy efficiency at the speed limit. Any time you drive faster, the cost per mile or kilometer goes way up. Lots of one task trips, driving to work vs. walking or mass transit, lack of car pooling all contribute to poor overall energy efficiency. Maintenance of your car is another factor in the use of gasoline. Keeping your car at an optimum level of operation will also contribute to better gasoline mileage. High speed acceleration literally burns gasoline at a huge rate, only to have to apply the brakes shortly after as you approach another stop sign, stop light or catch up to a car ahead of you. You wear down your brakes prematurely and there is more wear and tear on your tires. All of this hits your pocket book really hard. Brakes and tires are expensive to repair and the gasoline you use is becoming more expensive all of the time. Producing brakes and rubber tires uses a lot of energy as well so any time you delay the replacement of these components saves your pocket book at it increases your energy efficiency. High Speed – Highway speed limits are designed for safety primarily. When it says 60 miles per hour or 100 kilometers per hour this is the speed that your car should be driven. It turns out that the optimum speed for maximum energy efficiency is near this speed as well. Anytime you drive faster than these speeds you are actually burning more gasoline or diesel fuel per mile than you would at lower speeds. In Texas and a number of other states, speed limits are set at 75 miles per hour and there is talk of increasing them even higher to 80 or 85 miles per hour. While the road can accommodate these speeds, your car’s engine is not designed for this speed in terms of fuel efficiency. Try an experiment sometime and measure the gas usage at various speeds and it will become self evident. Fresh oil, new spark plugs or injectors, the right kind of gasoline, a clean air filter all contribute to better gas mileage. Although it can be expensive to take the car to the garage and have a tune up completed, your car will be running at its maximum fuel efficiency. Low tire pressure is not only unsafe since your car is less maneuverable at high speeds when the tires are low on pressure, they also will cause your car to use more fuel. The reason is that they have more surface area touching the road and there is more resistance. This drives the use of fuel higher and your costs up. Check your tires pressure on a regular basis even if you have one of these tire pressure monitor systems installed. Your tires can be down a few pounds without the monitoring system alerting you to a low pressure condition. Check all of your tires on a regular basis. Plan Trips – How many trips do you make every day? Could you combine some of them so you actually take the car out less? Anyone making multiple trips in the same direction is using far more gas than they need to, plus short trips were the engine does not fully warm up to operating temperature is actually harder on your car than a longer drive. Plan your trips so that all of your errands are done at the same time and even delay errands until you have several to make better use of your car and conserve gasoline. There are still far too many people driving their cars vs. using mass transit systems. While there is a cost to using mass transit, compared to using your car, the cost of gasoline, the wear and tear on your car and parking costs, mass transit is a bargain at almost any cost. Stop driving, take mass transit and you will be far more relaxed when you get to work. Read, work or sleep while you on the transit system. It will bring your blood pressure down for sure. Walking vs. Driving – Both of my kids have cars, yet they both walk to work. Imagine the money they are saving, how much they help the environment and the exercise they are getting. This is just a win, win situation. Anytime you can walk instead of taking your car saves gasoline and you get fresh air and exercise. Now we are turning to the home, which is another large part of our lives and a huge energy user. If we can cut the cost of energy by 20% in our homes by using energy efficient solutions we are making a huge contribution to our pocket book and the environment. We will discuss a number of areas that most consumer home owners can consider and impact the cash they spend every day around their home from an energy perspective. Switch to LED Lighting – If you are still using incandescent lights, it is time to switch to either fluorescent or LED lights. They save so much energy and last so much longer it just makes sense to switch. These kinds of light bulbs cost more, however the energy that is saved will ensure a relatively short payback even with the higher initial cost. In fact most stores are gradually switching over to the new lights and pretty soon you will not be able to purchase incandescent lights as well. Switch now for an immediate energy efficient solution. The cost of electricity is going up every year and it will continue to do so as we depend on oil and coal and lately natural gas to generate much of our electricity. Even nuclear fuel generating plants are costing more due to the increased safety concerns. Whenever you can reduce your electrical usage, you are saving money and also contributing to improving the environment. Turn lights off, take advantage of time of day electrical rates, use a microwave instead of a regular oven, turning down your thermostat in winter and up in the summer to reduce electrical usage will all reduce your electrical usage. Whether you heat and cool your home with electricity, natural gas or oil, the cost is going up all of the time. If you use less, then you are going to save money and use less energy. Turn down the thermostat in the winter time, especially when you are not at home. Turn up the thermostat in the summer time to reduce the cooling load. Consumers can save a significant amount of cost by following these steps. Use an electronic thermostat that you can program so that your home is automatically controlled while you are not at home. There are systems available now that allow you to control the temperature at home while you are away from home. Upgrade now if you do not have one of these. Brand new homes are very well insulated to today’s standards. Older homes, even homes that are only 5 years old will not be insulated to the same standard. Homes that are 20 years old and older will benefit from increase insulation and air exchange systems that will increase the energy efficiency of your home over all. Increase the insulation in your attic, change your windows to improve the insulating value and make sure that all caulking is up to date and that your home is well sealed. 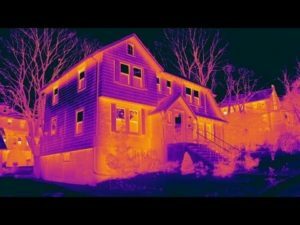 Combining improved insulation and some of the other suggestions we are making in this post will make a huge decrease in your overall energy use. Sealing Windows and Doors – Windows and doors are prime areas were cold air can penetrate in the winter time and of course the reverse in the summer. Consumers can arrange for a pressure test to confirm were all of the air leaks are around your home and them take the steps necessary to install weather strips and caulking were needed. Another little known fact is that electrical plugs on outside walls can be a source of air exchange. Sealing these can help to reduce the amount of air being allowed into the home. We discussed installing an electronic thermostat earlier. These thermostats can be set to vary the temperature up to a minimum of four times a day so that the temperature is controlled while you are in the house and lowered when you are gone for the day to work etc. Some will even allow for remote adjustment now as well. Turn down your thermostat at night when you are sleeping and also when everyone is gone to work or school. The thermostat can be set to warm up the house just before everyone comes home. One of our neighbors leaves his thermostat set at the same temperature all day long whether he is at work or going on vacation. This is a tremendous waste of energy and money. If you are not there, why heat or cool the house and spend money needlessly. If you are concerned about freezing pipes in the winter time, make sure your thermostat is turned down, but that the furnace continues to keep the temperature of the home at a reasonable level. Turning the Lights Off – This is a big issue in our house. Lights are constantly being left on in our house when no one is in the room. The same thing applies to the TV. It can be blaring away and no one watching it. Turn off lights, TV’s, Radios, and Computers etc if they are not being used or no one is in the room. There is a myth that a TV takes more energy to turn the TV screen on, so you should leave it on. 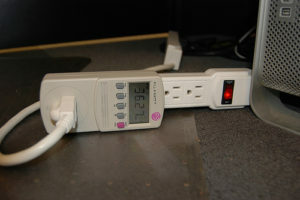 Not only does this reduce the life of your TV, you are using energy that need not be sued. Beside the TV’s today have a keep warm feature that allows for instant on. When we go on vacation, we turn the power off completely to reduce our energy usage of even this small component. There is really no need to have your water temperature scalding hot, in fact it can be downright dangerous. Turning the temperature a few degrees will save you money as well. Find a temperature that makes sense for your family and leave it at this temperature. When you go on vacation for longer than a couple of weeks, you might also consider turning down the temperature as well to save money in heating water that will not be used anytime soon. When you return simply turn it up again. Adding Insulation to the Hot Water Pipes – Our water heater is located in one corner of the basement and the bathrooms are in the other corner. Seems like a bad design, but since we cannot do anything about this, the next best thing is to insulate the exposed hot water pipes to keep the water hot in the pipes longer. Your water will heat up faster as well when you turn the hot water on in your sinks. Another approach is to install instant on hot water heaters close to were you use hot water the most. Also consider installing a high efficiency water heater to maximize the energy efficient solution. If you have an older furnace, your probably losing 20 or 30% of the energy up the chimney compared to a high efficiency furnace. The savings in energy costs will likely pay for the cost of the new furnace in 5 to 8 years depending on the size of your home. It also depends on the temperature that you keep your home at. Outdoor temperatures also play apart in the overall cost savings. We upgraded to a mid efficiency over 10 years ago and this furnace paid for itself in 7.5 years. in some cities, local electrical companies are installing meters that will report energy usage by the hour. With this information they can charge rates for the electricity used based on the time of day. In our municipality, they charge almost double for electricity used during the day vs. the electricity used in the evening. Makes a lot of sense to dry clothes with the dryer in the evening. Run the dishwasher etc in the evening. Any transfer of electrical usage you can make from day time use to night time use is going to save you money. There are many solutions available for homeowners. Which when applied can be used to save energy use and decrease your overall cost. We have listed a few of them here in this part of the post. However we are confident that there are many more and look forward to contributions from readers. Solar Blankets for the Pool – If you have a pool, a solar blanket can be used to keep the water warm as well as help to heat the water as well. It takes a little work to remove it and put it in place. But time and your labor is free and you are saving energy use as well compared to heating the pool with a pool heater. Solar Heater for the Pool – are another approach that can be used that involves little extra energy use. Rubber solar panels on the roof of your home with the water circulating though will heat the water rapidly. They will transfer this heat to the pool water. The drawback of this approach is that you must run the pool pump during the day when the sun is shining. The electrical rates are at the highest levels in areas where you have time of day charges for electrical usage. for those people who are truly motivated, a manual push mower uses your manual power to turn the blades and cut the grass vs. a mower that is run by gasoline or run by electricity. You can certainly save money in this situation; however for small lawns the returns may not be that extensive. Solar Lights – are the most popular for decorative lighting in yards etc. They are improving and are being used more and more for outdoor lighting solutions for security and for enhancement of your yard. Well that’s it for this rather long post. We will do another one in a few months covering an entire new set of topics. Hope you enjoyed reading this one. Energy efficiency audits can tell you a lot about your home. Our home is approximately 25 years old. It is in need of some upgrades regarding windows that need replacement. Also a furnace that needs to be replaced and even our hot water tank. We were wondering if we should apply for an energy efficiency audit. Or just make the changes we planned and proceed from there. You have to pay for the audit. In some jurisdictions you will receive some of the money back once you complete the audit of all of the changes you have made and confirm that your home is now more energy efficient. We have read a number of posts from people who have had an energy efficiency audit completed. As well as looked at a number of web sites from official government sources. Our conclusion is that it really depends on were you live. In addition what programs are available to help consumers improve the energy efficiency of their homes. Each person must evaluate these factors based on were they live and the condition of their home, before they embark on an energy efficiency audit. One post we read indicated that after the audit was completed and the rebates provided, the audit cost approximately $100 which is not too bad. Once you have the audit with recommendations for what needs to be done to improve your home you are eligible for rebates. You can then apply for rebates on the upgrades only after the work is completed. Before you can apply, you must have another audit to prove that you actually made some changes. In addition that your energy efficiency actually got better. The rebates will depend on what you did and what is available in your state or province. Be prepared to shoulder the full financial cost in case the rebates do not apply. Or they are canceled or they feel that you did not do enough to improve your energy efficiency. This may or may not be something that everyone is interested in. If you are planning to sell your home anytime soon and also planning to do some upgrades in preparation, having one of these reports can only be a good thing. That is assuming that the report shows improvement . But also shows that you have a good rating for your home in terms of energy efficiency. I guess if your audit does not work out, they you just do not mention it when it comes time to sell your home. We have thought about just going ahead and doing some of the up grades our selves without an audit. For example upgrade the furnace, replace the windows, seal all of the doors and add insulation in the attic. What we would lose is any rebates that the government is providing which may or may not be substantial. We might also be spending money for nothing. I recently spoke to a neighbor who has original windows in his home like ours. He just had an audit completed and the auditor said that there was no need to replace the windows. Since the R rating was ok and there were no leaks or areas were the wood was failing i.e. rotting. His energy rating was also pretty good. Basically he found out that if he spent some money on his house, he probably would not be eligible for any grants since his home was already pretty good. The bottom line is that if you approach the problem in a scientific manner, you will get a better result. Hence also make better more informed decisions as well about improving your home from an energy efficiency perspective. This is the best way to proceed, we think in terms of knowing what state your home is actually in. We will be looking into having someone come over to complete an energy audit for us before we spend any significant amount of money. What is Green Energy Anyway? What is Green Energy Anyway? Well the answer is that it really depends on who you talk to and what you read. 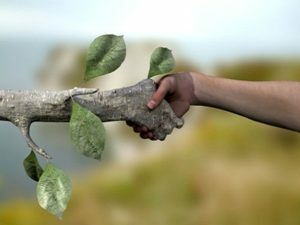 Fortunately many companies have realized that it is important to be seen to be on the Green bandwagon. Unfortunately many are using this new phenomenon to further market their existing products. They may or may not use green sources of energy. We decided to write this post, because as we are doing some of the research for our posts we started to realize that all energy generation causes pollution of some kind – Air, visual, habitat and manufacturing processes. Take your local electrical supply company. If you read some of the brochures in your monthly bill, or read their annual reports, they will likely talk about how they are gradually going green and buying power from green electrical generation companies. But what is really green and were does the power come from, given that our power system across North America is totally connected and integrated? Power comes from coal and oil fired plants, it comes from nuclear generating plants and power also comes from hydro electric generation plants which are dams that use flowing water to turn turbines to generate electrical power. Added to the mix is power from solar panels and wind farms that are increasingly being set up! In my opinion, all power generation has an impact on the environment depending on how the equipment is manufactured, depending on the footprint of the facility that generates power and of course the fuel or energy source that is used. Wind farms and solar power generation are broadly accepted as green technology because they do not pollute the air, however they do pollute our space and they take up a lot of land. Hydro generation causes thousands of acres of land and wildlife habitat to be flooded. So are they really green? These are very difficult to measure so that you have absolute comparisons. We have yet to come across any real comparisons using mathematical or financial measures. What we have read so far are really opinions based on perceived common sense which can be suspect some times. It appears that hydro generation from dams and rivers would have the largest impact since thousands of square miles can be flooded. However I have not seen comparisons of how much land would be covered if you generated the same amount of power from solar panels for example. It could be calculated and some would say that if you confined the solar panels to roof tops and desert areas, what is the harm. We have not found anyone looking at this yet, although the information may be there. Oil, coal and uranium to power nuclear sites are clearly the most polluting in terms of the air and radiation. But do not forget the mines that these fuels come from in the case of coal and the impact on our economy for the oil we pay to other countries. And nuclear power really has a bad name these days due to the catastrophe in Japan. All of these plants must be connected to the grid. Power lines must connect to dams and solar power as well as wind farms, while new oil and coal plants can be built closer to were the power will be consumed. If you do not like long miles of power lines, then dams will not be your favorite source of power. Nor will wind farms or solar power since they must be located were they can maximize the efficiency of power generation. This one is incredibly complex. All of the systems that generate power have a manufacturing process, some which have less impact on the environment than others. Right now it looks like that solar panels might be the worst based on a kilowatt of power generated, but that is just opinion at this point. We would like to get your comments on this subject and any sites that can provide more information.